Yokohama's new tire is produced in an emissions-free plant using peels discarded by orange juice manufacturers. LOS ANGELES -- Yokohama Tire Corp. is going green by going orange. Using oil extracted from waste orange peels, Yokohama has created a tire that sharply reduces the amount of petroleum required to make the finished product. It takes nearly 20 gallons of petroleum to make a set of tires. If the U.S. car market is 10 million units this year, tires on new cars sold would account for 5 million barrels of oil. By infusing orange oil into natural rubber, Yokohama has reduced the petroleum used in its dB Super E-spec tires by 80 percent. “We’ve been working on this technology for 20 years,” said Mark Chung, Yokohama director of strategic marketing. The tires have been tested in racing venues, including most recently in the Porsche GT3 Class series. The street tire’s wear and braking performance also are on par with standard tires, Chung said. During a harsh closed-course test in a Mini Cooper S, the tires felt balanced and in control, although a little more prone to squeal and howl under duress. But the majority of drivers never would notice that the tires were produced any differently. Appealing to the hybrid crowd, the Yokohama orange tire also has 22 percent lower rolling resistance than the standard tire on a Toyota Prius, meaning better fuel economy. The inner liner of the tire, called AirTex, is practically impermeable. That means the tire loses only 1 to 3 percent of its air per month, compared with 3 to 5 percent in many tires. Low tire pressure means increased drag and decreased fuel economy. 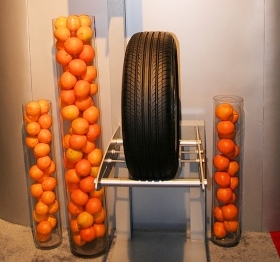 Also, the orange tire weighs 2 pounds less than most tires, meaning less unsprung weight for the car. Finally, the tire is produced in an emissions-free plant using peels discarded by orange juice manufacturers. “It’s not like we’re growing orange groves to do this,” Chung said. Sadly, the tires don’t have a citrusy scent when they heat up. To test the market, Yokohama is initially producing the tire as a replacement on the Mini Cooper, Prius, Honda Civic Hybrid, Honda Insight and Nissan Versa. The catch is that the tire is premium-priced. At tirerack.com, the typical Prius replacement tire is the Goodyear Integrity, priced at $74 per tire. By contrast, the Yokohama dB Super E-spec is $105.